William Kituuka Kiwanuka: HOW IS IT REPLACING BESIGYE WHEN HE CAN CONTEST IN 2016? HOW IS IT REPLACING BESIGYE WHEN HE CAN CONTEST IN 2016? Nandala Mafabi is vying for Besigyes seat. By Henry Mukasa and A. Ssenyonga Forum for Democratic Change (FDC) needs sh700m to convene its delegates’ conference that will elect a new leader to succeed the founder, Col. (rtd) Dr. Kizza Besigye, this year. Besigye announced during FDC’s 5th National Council meeting at the party headquarters early this year that he would step down before his term expires in 2014. However, party officials said he could still contest as party-flag bearer during the 2016 presidential elections. Speaking at the party headquarters at Najjanankumbi on Monday, Besigye said he would chair the fundraising drive. Besigye urged FDC members, supporters and wellwishers to help raise funds for the party. He assured members that the transition from his leadership to another will not split the party. The contest to replace Besigye has so far drawn the Leader of Opposition, Nandala Mafabi, FDC national mobiliser Mugisha Muntu and shadow finance minister Geoffrey Ekanya. Besigye said he would not endorse any of the trio because he trusts that either of them can take charge of the duties of party president. On whether FDC would rally behind Muwanga Kivumbi (DP) in the Butambala by-elections, Besigye said he could not force FDC aspirants to drop their ambitions, but his party was alive to the need for a united opposition. 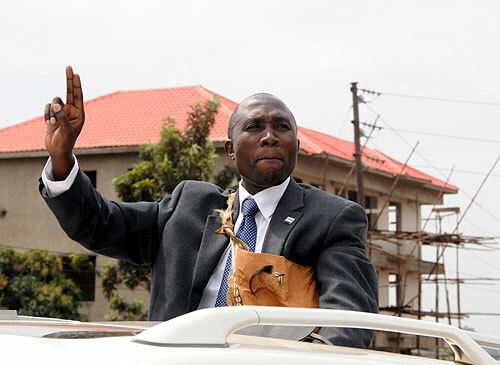 Kivumbi is the leader of Popular Resistance Against Life Presidency, a political pressure group. “We don’t compete against NRM, but partisan state structures; the Police, intelligence, RDCs and the abuse of public funds. We need liberation from a dictatorship,” he said.